WHA? I know, this is totally not my style. 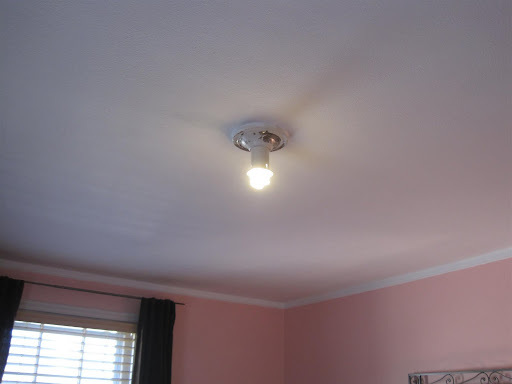 This room was painted (YES, BY ME) within two months of moving into the house because I was just TOO EXCITED to paint all the bedrooms. Big mistake! Always take your time and think it through before painting! This room functions as my dressing room...hence the exorbitant amount of sweaters on that shelf. With the paint and decor, I was going for 'Victoria's Secret', but ended up with 'Circus Nursery.' Britney Spears would probably love this room. I also didn't take the time to sand, prime and paint all the trim before painting the walls (I only did the ceiling and baseboards first) so all that has to be done before I can fix this disaster. What a rookie mistake! It's amazing how much I've learned in one year. The pink is not horrible, but it's just not for me. 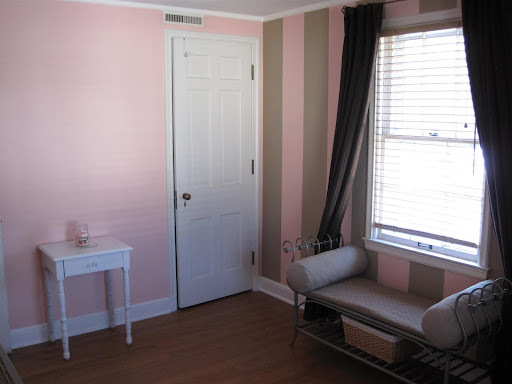 I'm tired of everyone thinking it's a little girls room. 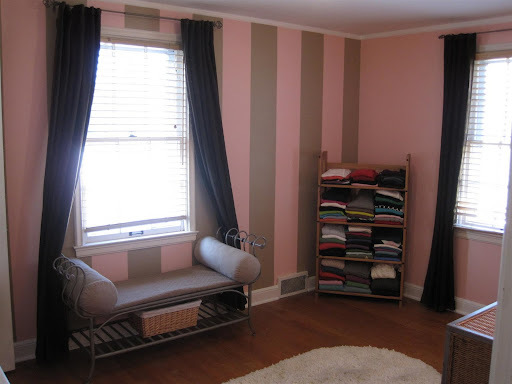 And the brown stripes were supposed to be bold, but turned out boring and 'pastel' because I just used leftover paint from our living room instead of buying something specific for this particular shade of pink. I've really learned that rushing never is a good idea....oh, and that my cat loves to pee on shag rugs. No offending brassieres in that one! And the color actually looks better, I think. So, there is some potential to do a 'corner unit' in the corner between the windows, I'm still mulling it over. I don't really care for the color of the wicker dresser anymore, but I don't think there is much I can do with it. I could move it elsewhere in the room, (or out altogether) but I do use it frequently, and it was expensive, so I want to keep it. It also matches the rest of the set in the guest bedroom. My colors for this room will be some sort of gray and yellow, I love that combo and it can still work for a nursery IF the day ever comes when we need one. 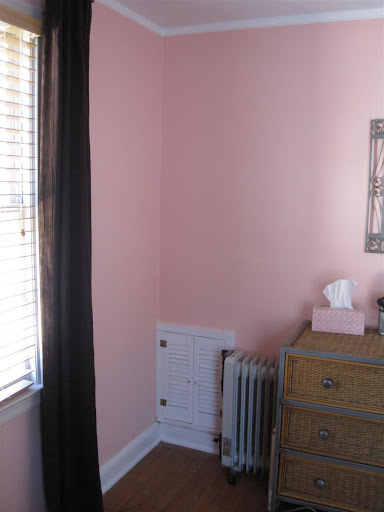 Or maybe not, on most days you can almost see your breath in this room....we'd have our very own baby-popsicle! Hopefully this weekend I'll be able to dive in and do some good stuff to this room. If it makes you feel any better, I can totally see where you were going with the space! I love the wicker dresser but if you're tired of it you could always consider painting the wicker white or possibly even gray. LOL - I love the witty way you write. I like that color pink, I'm sure whatever you end up doing will be amamzing....no fair your own dressing room! Oh, I feel your pain! I love to jump into things too. That's why we have repainted the guest room 3 times. No lie. Hm, fabric over the dresser? I hadn't thought of that! I'm hoping that changing the wall color to a gray will make the dresser look nicer because it already has that aged pewter frame...we'll see! Yellow & Grey .... YES, YES, YES! I think we've all made bad color choices before... I know I have more than once! Aren't we so much wiser now?? I could see the whole 'Victoria's Secret' thing, especially with those stripes. I think the yellow & grey will look very sophisticated though. I'm sure a fresh coat of paint alone will work wonders in this room! You have a DRESSING ROOM?? Haha I'm sure you know how lucky you are. I actually don't mind the pink but I'm excited to see the yellow and gray. As for hasty color decisions, I've been there. When I bought my house it wasn't livable (true story) so I had to paint right away- I actually let my brother choose the colors. He did a pretty good job, but I could have had a lot more fun with it had I taken more time. You are so funny - I love the Victoria's Secret vs. the Circus Nursery. Ha ha! Seriously though, you're on the verge of a very feminine French boudoir sort of look. I say run with it! If I were you, I'd switch the guest room and your dressing room. I'd LOVE to have full length mirrors in the room I was getting dressed in. And that green color in the g.r. would look pretty next to your new fabric! Erin, I have thought about doing that a million times. However, that big ole mirrored closet is FULL of extra bedding, pillows, air mattresses, lamps, throw blankets, etc, so I wouldn't know where to put all that stuff as I don't want it out in the open. 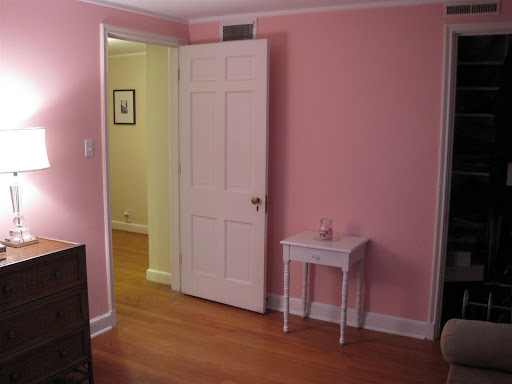 Also, the pink room is pretty tiny so that is why I picked the frivolous 'dressing room' purpose for it. I will be getting a full length leaning mirror for that room, though! 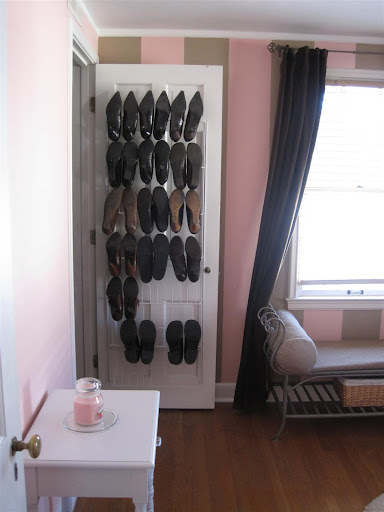 What are you using to store your shoes? How is it mounted to the door?